We recently took our dog for a walk in a park we had only been to a few times. It was a very foggy morning and when we got out of the car, we noticed that it was impossibly hard to see people, dogs etc… anywhere more than 5m away. Her senses were immediately in overdrive, sniffing, scenting the air, ears searching for sounds and stopping and focusing at vague shapes in the fog. She was still responding to my cues but was definitely in a peaked state of arousal. We opted to do some on lead scenting before progressing to some rope play off lead, we did this for around 45mins and went home. Everything was fine, but it wasn’t fine by accident. It could well have been a different story. So why did it go well? In short awareness. Awareness that our dog is sensitive and can be worried by boisterous dogs and strange people, awareness that the lack of vision would make the issue of strange people and boisterous dogs more scary for her, awareness that playing ball like we usually do could bring her into unexpected contact with these issues, awareness that this park was a newish environment to her so may be more unsettling than a known area, awareness that sniffing/scenting can help her learn about her environment and relax her and awareness that rope play can use her energy while keeping her close by. Small things can play a big role when training and interacting with your dog. The more you are aware of your surroundings and the impact they can have the better you will be at adapting your training and ensuring your dog has a good outcome. In this case, we made some adaptations to how we interacted with our dog, but for dogs with more complex issues the solution may have simply been to turn around and go somewhere where the dog was comfortable and confident. Recognising the situation and responding appropriately for your dog’s needs is an important part of training, especially with fear based issues. 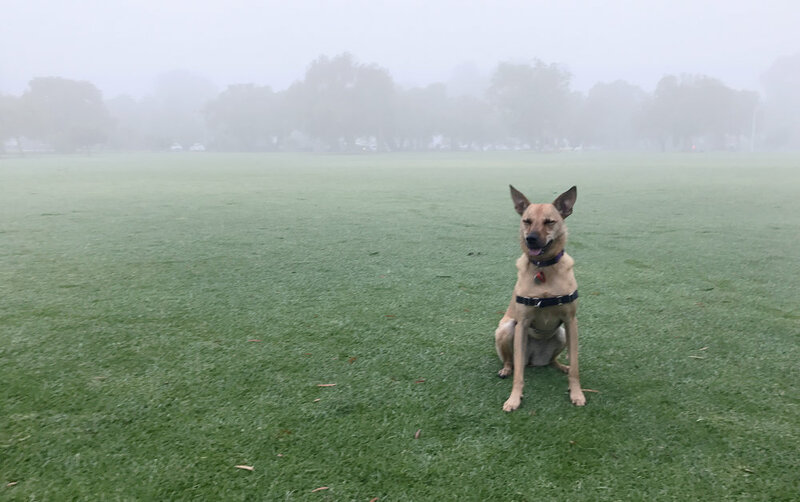 The difference between a park and a park on a foggy day can be huge but there are also so many other scenarios that can vary in their intensity. So next time you’re out with your dog what potential issues will you be looking out for and what will you do to address them?